Georgetown Newspapers, Inc. is located in the heart of Kentucky at the intersections of I-75 and I-64. We have a 12-unit Goss Community press including a Goss 4-High color unit with virtually perfect registration. We are capable of printing up to 16 broad sheet pages, including 8 pages of process color at 15,000 per hour. Known for customer service and attention to detail, our full press, mailroom and packaging staff is ready and able to take handle all of your printing needs. Kansa inserting machines neatly place preprinted inserts into the jacket of any broad sheet section. 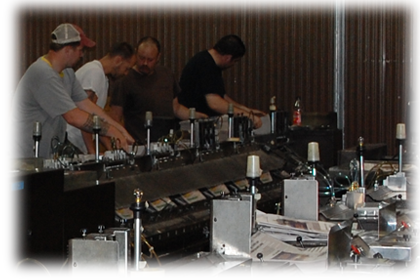 Our fully staffed mailroom has the ability to manufacture multiple newspapers daily and handles hundreds of thousands of inserts monthly. Georgetown also offers sheet-fed, magazine quality printing for single page flyers and brochures to stitched and trimmed magazines on a state-of-the-art Ryobi press. We will deliver your completed products to your office or directly to the US post office.